The duet, “Who Will Love Me as I Am?,” will be sung by the show’s stars, Erin Davie and Emily Padgett, who play characters based on the real-life conjoined twins Daisy and Violet Hilton. It is scheduled to be shown about 7:45 p.m. on a huge screen operated by Clear Channel Spectacolor at Broadway and 47th Street, near the red staircase at Duffy Square. 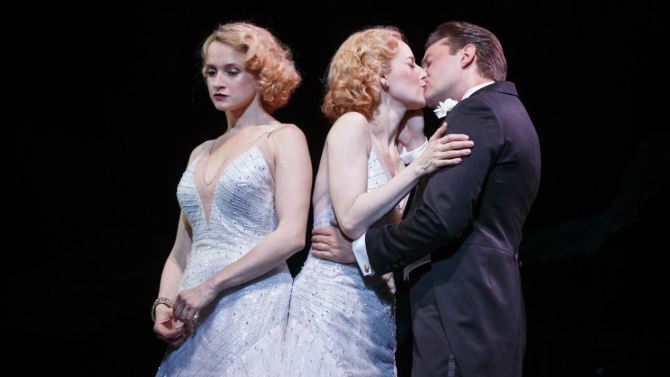 The Metropolitan Opera has hosted screenings in Times Square for its opening nights but the “Side Show” event is billed “the first time in history a Broadway number will be aired live in Times Square from an opening night performance.” But will you be able to hear it? You’ll have no problem hearing the National Theatre Live broadcast of the recent Broadway production “Of Mice and Men,” currently being shown internationally on various days during the next several months. It stars James Franco and Chris O’Dowd and was directed by Tony winner Anne Shapiro. To find a venue near you, click here. My local venue, Monmouth University, West Long Branch, NJ, will show it March 12. Meanwhile, I’m binge watching “Theater Close-Up” on PBS. Loved the Oct. 2 showing of the Mint Theater’s “London Wall” by John Van Druten. Now watching the Public Theater’s Apple Family plays back-to-back. Click here for more info. 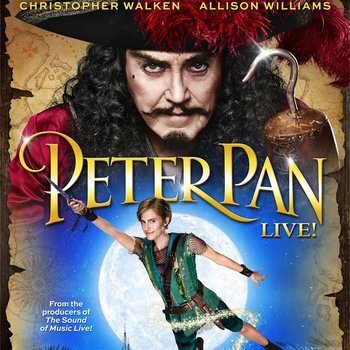 NBC’s official poster for the Dec. 4 live broadcast of “Peter Pan” starring Allison Williams and Christopher Walken. I loved that NBC took the risk last year of airing “The Sound of Music” live and I will tune into the Dec. 4 live showing of “Peter Pan” on the same channel. I’m curious to see Allison Williams, NBC Nightly News newscaster Brian Williams’ daughter in the title role. But mostly I can’t wait to see Christopher Walken as Capt. Hook. I can already hear him munching on the scenery. And, of course, you never want to miss watching theater regulars Christian Borle and Kelli O’Hara do their thing as Mr. and Mrs. Darling. Of Mice and Men” rather than, I don’t know, NBC? (Yeah, I know, the ratings wouldn’t be as great as they will be for a beloved musical.) There’s got to be room for American plays on American TV with some regularity. We know there is an audience for them. UPDATE: The “live” event didn’t happen after all. Opening nights never start on time — too many show folk saying hello, I suppose. The Act 1 finale — which was to be the first opening-night performance in history aired live in Times Square — didn’t go on until after 8 p.m. because the curtain rose about 25 minutes late. The song couldn’t make its 7:45 PM live call. A taped version of “Who Will Love Me As I Am?” was used and fans probably didn’t know the difference. But it wasn’t what they were promised, historically speaking.